Great post..I love anyone’s mention of their grandmother! I started my blog here on 10/25 and had to figure out what this Nablopomo thing was, but I did it! I made it just under the wire with tonight,s post! I have so enjoyed reading your blog, and getting to know so many great people on WP. Happy Holidays! Thanks, Kim, for being such a loyal follower. I’m glad you made it in to Nablopomo. 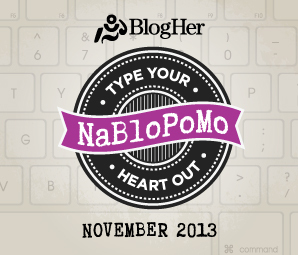 And did you know there is another Nablopomo? Yes. December. Come and join. Happy holidays to you, too. This took a lot to compile. I’m glad you made it through the month! You’re right. The list of commenters did take a while to do…and then there were those few where the links didn’t work right. I worked up to the last minute, but still had to spill over into December. 1. Oh well. I did finish. Thanks for following along.